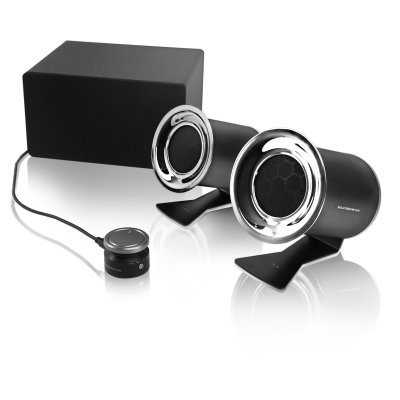 soundscience rockus™ 3D | 2.1 speaker system creates a personal home theater experience that brings the power and realism of 3D sound together with the clarity and accuracy of high-fidelity audio. 3Dsst™, soundscience's 3D technology, actively analyzes incoming stereo audio signals and intelligently places them into a 3D sound field. The results are a personal theater experience with realistic, immersive 3D soundscapes for your movies and games from 2.1 speakers - whether it's the impact of an explosion, the snap of a baseball whizzing by a player's face, or the thunder and fury of a videogame gunfight. The rockus also features a dedicated music mode optimized for superb stereo sound reproduction, letting you hear your music with deep, visceral sub-bass and spacious crisp, mids and highs. soundscience puts 3D cinematic sound and high-fidelity music in its place: Your room.